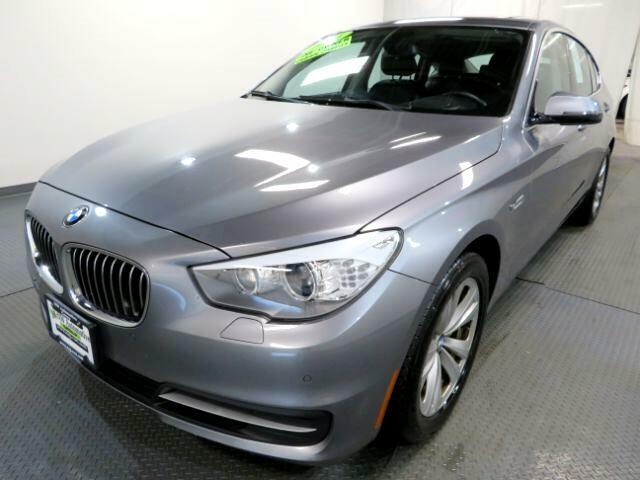 On display in beautiful Glacier Silver Metallic, our 2014 BMW 535i xDrive Gran Turismo AWD is a stylish and efficient traveling companion. Powered by a smooth 302hp 3.0 Liter Turbo Charged V6 that is perfectly paired with a responsive 8 Speed shiftable Automatic, this All Wheel Drive sprints from zero to 60mph in just 6.6 seconds and scores near 26mpg on the highway. You''''''''ll be ecstatic with the combination of sport sedan handling and sport utility practicality that fulfills all of your demands. Slip inside the tranquil interior of this 535i xDrive GT, take in the view from the panoramic sunroof, and enjoy the wealth of amenities that surround you. The sensation of supple leather on 10-way power front seats, a leather-wrapped steering wheel and dual-zone automatic climate control immerse you in complete comfort. You''''''''ll appreciate the ease of use of our iDrive electronics interface as you stay connected via Bluetooth or listen to HD radio on a fantastic sound system. BMW''''''''s stellar reputation for safety holds true with advanced features such as emergency communications, front and rear parking sensors and stability/traction control. Distinguished performance, incomparable style, and state of the art technology are what you expect from BMW...and this 535i Gran Turismo exceeds those expectations! Print this page and call us Now... We Know You Will Enjoy Your Test Drive Towards Ownership! Internet Special, Interest rates starting Low as 1.99 for Qualified Buyers, Special financing available, Low monthly payments, No Credit, Bad Credit with still have Lenders that can Finance you! Log onto are direct website Nag-cars.com Two Location to choose from...Sales Tax, Title, License Fee, Registration Fee, Dealer Documentary Fee, Finance Charges, Emission Testing Fees and Compliance Fees are additional to the advertised price. Message: Thought you might be interested in this 2014 BMW 5-Series Gran Turismo.